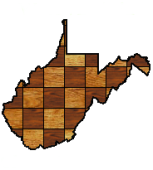 12 players competed in the 2018 WV Action Championship held in Mount Nebo, WV. The event was scheduled to run concurrently with the 3rd Annual Missing Pieces Charity Event. Unfortunately, no players showed up for the charity event, although a donation was still able to be made from the proceeds. The open section was won convincingly by Sam Timmons at 5.5/6. Three players tied for second a point and a half (!) back at 4/6. This entry was posted in Results on June 2, 2018 by wvchess.